Rock climbers have every reason to be jealous of geckos' extraordinary climbing ability. Geckos can scale a variety of vertical surfaces with ease and have even been known to casually sleep upside down. For a long time, this talent seemed to defy the laws of physics, and it wasn't until recently that physicists actually uncovered the mechanism that makes their feet so sticky. 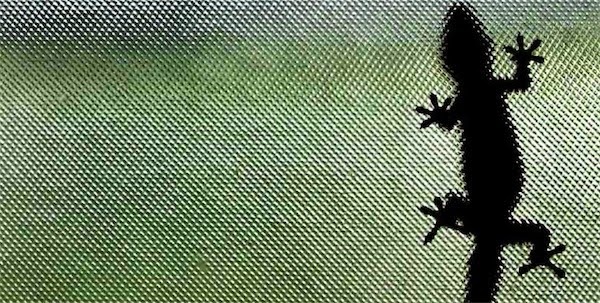 The usual sticky culprits such as suction cups, mucous, or velcro-like hooks were all shown not to apply for gecko feet, and it was not until 2002 that researchers realized it was actually the van der Waals force in action. The van der Waals force is a very tiny attraction between individual molecules over nanometer-scale distances. When you press your hand against the surface of a wall, the molecules at the very surface of your skin are attracted to the molecules in the wall, but this attraction is only significant if enough of your skin molecules are extremely close to the wall. We don't notice this van der Waals force in our everyday lives because our fingertips and all the surfaces around us are just too bumpy and uneven on a microscopic scale to get enough molecules in close contact. 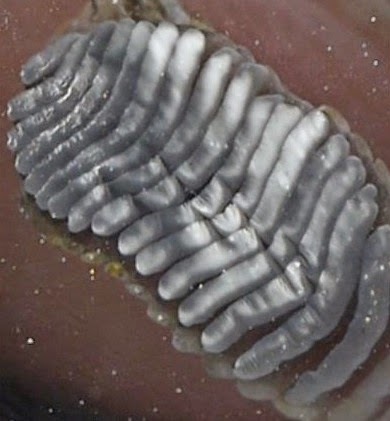 The ridges of a weight-bearing gecko foot. from Hawkes et. al. 2014. However the pads of gecko feet are not like human skin. The ridges on gecko feet are actually made up of loads of tiny hairs, or setae, which can mold around rough and pocketed surfaces. With the increased surface area from the individual hairs, geckos can support their full weight simply by the van der Waals force. Once this nanoscale technique was discovered, a lot of work went into creating dry adhesives in various bio-inspired devices. Recent innovations include climbing pads for small robots and ultra-strong dry tape. The stickiness that comes from the van der Waals force has the advantage of being dry and reusable (no messy liquids to deal with), as well as easy to turn off and on. When geckos need to lift their feet, they simply change the force applied to their feet pads so that the 'hairs' curve and lose connection with the surface. But in the past, these adhesive pads have been unable carry human weight without becoming impractically large, and often catastrophically failed if a section of the pad peeled off. 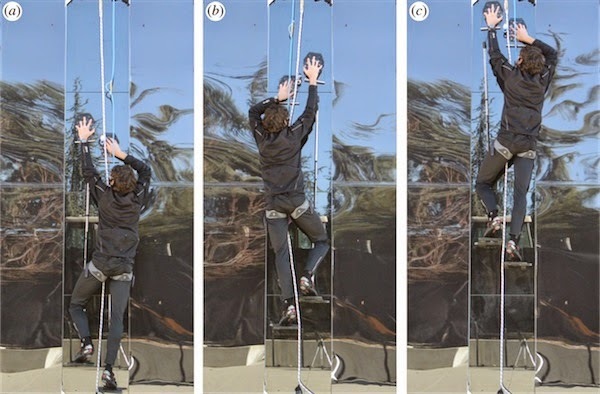 Now, a team from Stanford University has just published a paper demonstrating climbing pads that allow a human to successfully climb glass wall using the van der Waals force. This might sound a tiny bit familiar — earlier this year, DARPA also created a very similar gecko-inspired device, but as the Stanford team notes in their paper, the details of the DARPA adhesive material have yet to be disclosed. The Stanford team, lead by Mark Cutkosky, was specifically interested in how small pads, capable of suspending geckos or light robots, could be scaled up for safe and reliable human use. Judging from this video, they've had great success. Note that the climber is standing on steps attached to the hand pads, so all the suspension comes from the pads. The key is to use a grid of small, independent tiles, each covered in a surface of micrometer-scale wedges for good van der Waals attraction. The grid of tiles, which mimics the ridges in gecko feet, adapts well to slightly curved surfaces. The team found that in order to create a pad that could bear a person's weight, each tile had to be mounted in such a way as to spread the weight of the climber evenly across the tiles. 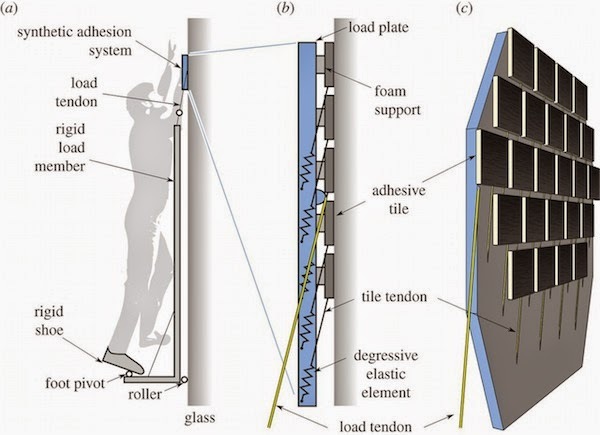 They achieve this by attaching the tiles with tendon-like cords and a unique type of springy material that becomes more flexible as it stretches. Of course these climbing pads are still being tested and a commercially available product may be a while yet. To all those climbers now hoping to repeat Chris Sharma's test pieces, first of all no cheating! And secondly, these pads only work on smooth surfaces like glass. In the future, the Stanford team hopes to incorporate more biological features from the real masters of the van der Waals force — geckos — in order to scale rougher surfaces.